Have you recently noticed that your dog is behaving awkwardly? If so, there is a chance that he or she is dealing with fleas. Fleas can be immensely irritating and they’ll drive your dog insane. On top of that, fleas can also be incredibly dangerous. Suffice to say, fleas are a problem that needs to be rectified as quickly as possible. Within this guide, you will learn all about the best flea spray for dogs and home. While attempting to find the best flea spray for home and furniture, you’ll want to make sure that you keep your family safe. This is why you’ll first need to choose a chemical or non-chemical solution. Chemical sprays work exceptionally well, but they may be a little more dangerous than their natural counterparts. The most common and most effective chemical sprays will use insect growth regulators and pyrethrin. Fenoxycarb and pyriproxyfen tend to be the most common. When choosing a chemical option, you need to understand that some are suitable for indoor use and others are best for outdoor use. Be sure to choose the one that best suits your needs. Indoor chemicals are usually not effective for outside use. If you prefer to protect the environment, your family and your pet, you’ll want to stick with non-chemical solutions. The best natural solutions are those that utilize clove extract and peppermint oil. These two chemicals are capable of killing fleas and ticks on contact. Nematodes are another good option. 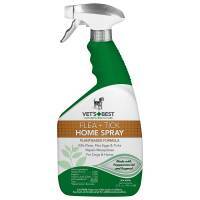 It is also important to choose the best home flea spray that will be safe for your pet. Some sprays can be applied directly to your dog, while others should not be. You’ll also need to consider how severe your problem has become. If you’re dealing with a very bad flea infestation, you need to invest in a much stronger flea spray. Some sprays, such as the Virbac Knockout E.S. Area Treatment Carpet Spray, should not be sprayed directly on your dog. Nevertheless, these sprays work great, as long as you use them with caution. While you’ll want to get rid of fleas, you’ll also want to make sure that you do not turn your home into a mess. This is why it is absolutely pertinent to make sure that you choose a product that will not create a mess. In fact, you should choose a spray that leaves no sticky residue and no unpleasant odor. If you make the wrong choice and select a messy spray, there is a good chance that you will not use it as recommended! After you’ve invested in the best flea spray, you’ll want to use it right away. After all, you shouldn’t let your dog suffer any longer than necessary. The good news is that using flea sprays is pretty basic. However, the instructions will depend on the specific product that you’re purchased. As mentioned above, many sprays can be used directly on the dog. These sprays can also be applied to common household surfaces, such as carpets and furniture. Other chemical sprays cannot be used in this manner. Therefore, you should read the back label carefully, before using these products. Using these sprays is pretty straightforward. Just remove the lid, aim it and spray. It is possible to use these products as a treatment and prevention. Once your dog has developed a flea problem, you can use the spray to get rid of the fleas right away. At the same time, it is possible to use the spray regularly to keep fleas at bay. With this in mind, it is incredibly wise to keep a can of flea spray on hand at all times. This will ensure that you’re prepared for pretty much anything that comes your way. 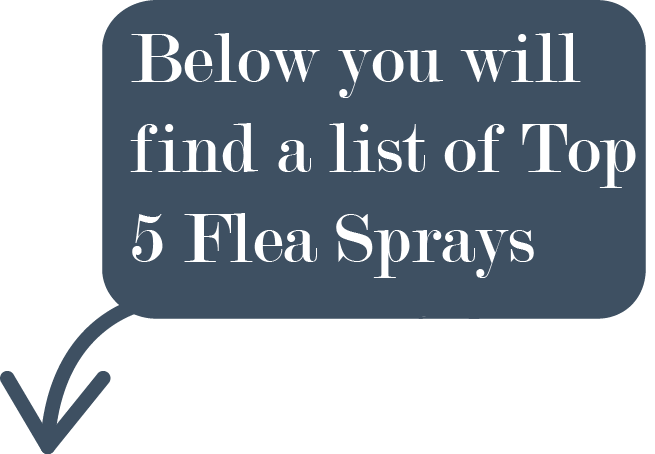 There is an assortment of flea sprays on the market and they’re different in various ways. As mentioned above, some can be safely applied to the dog’s coat and skin. Others cannot be. So, what is the difference? Some spray solutions are incredibly strong. These products might be too strong to be used on the pet directly. This has to do with the specific ingredients included in the product. These solutions are capable of eliminating fleas from your home and yard, but they should not be sprayed directly on your dog. They’re so strong that they can result in serious side effects. Many outdoor flea killers work great, but they should not be applied to the dog. So, why would anyone want to use one of these products? Well, they’re usually stronger and more effective than the alternatives. With a powerful spray, you’ll be able to keep fleas away from your home for seven months or longer. Finally, you must understand that chemical sprays are not a flawless solution. While they’ll definitely get rid of the fleas around and in your home, your dog likely travels elsewhere. These sprays might not be able to protect your dog at the park or vet. With this in mind, it is often best to use a combination of flea preventions to protect your dog. Using flea collars and flea pills can help. You should also consider throwing shampoo into the equation. By using a handful of products simultaneously, you’ll be able to keep your dog free of fleas for good! If you do any research whatsoever in flea and tick products for your pets, you will quickly discover that Vet’s Best is a brand name that has been established in the community for over 30 years now. Throughout these 30 years they have become to be well known for their dependability, reliability, and quality products. Well, it is safe to say that their new flea and tick pet and home spray was created with these same qualities. With their authentic and unique plant-based ingredients you never have to worry about poisoning your pet your family. How many products are truly made in the United States these days? Not many, and that is why it is important to support the companies that keep work in the states. Well, the Vet’s Best Flea & Tick Pet & Home Spray is completely manufactured and packaged right here in the United States, so when you invest in this product, you are actually putting money back into the community and economy. 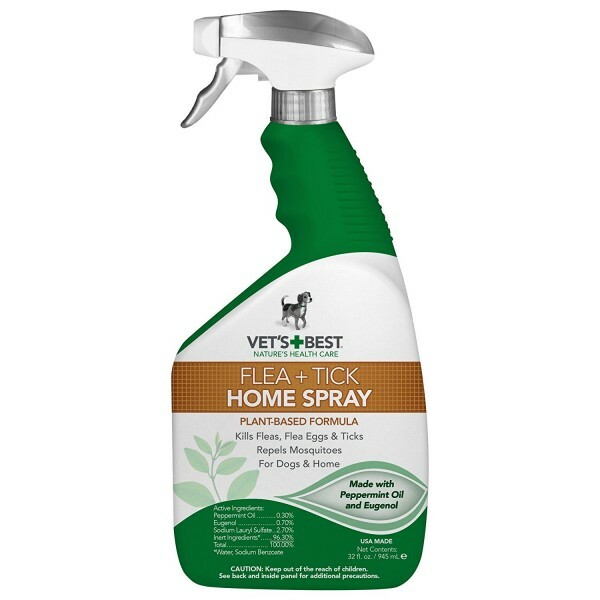 If you want a protect that will safely protect your pet and home, look no further than the all-natural Vet’s Best Flea & Tick Pet & Home Spray. You can literally spray this product anywhere in the home and be worry free. Owners are responsible for protecting their pets from fleas, ticks and mosquitos. But, how is this possible with pets that spend a lot of time outdoors? The answer is Wondercide Flea, Tick and Mosquito Control Spray. This product is designed for cats and dogs, so if you own a mixture of pets, you will no longer need to purchase separate products. The formula is safe for use on all pets, plus it can be applied directly to flooring, furniture, fabrics and carpet. Pets are just like humans, as they sometimes need a pick-me-up. Just one application of the Wondercide spray will provide your pet with an abundance of aromatherapeutic benefits, thanks to its lemongrass scent. This scent will boost your pets’ mood almost immediately after the first initial application. It is not unusual for pet products to contain ingredients that may be harmful to the coat and skin. 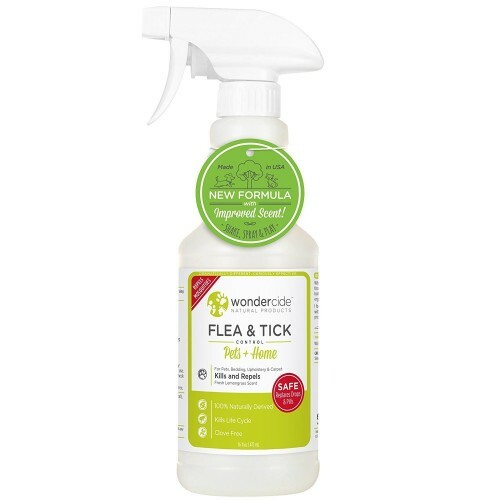 The blend of ingredients utilized to make the Wondercide Flea Spray is considered nontoxic. Instead, the ingredients will work together to protect your pet from mosquito and fleabites, as well as ticks. 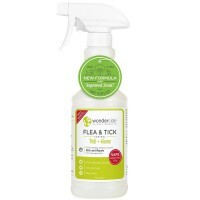 The Wondercide Flea And Tick Spray is a cheaper alternative to expensive prescription medications. The formula is nontoxic, all natural and non-staining. Just one application will go a long way in protecting your pet from the harmful parasite and insect bites. Are you looking for a product that is completely free of toxic chemicals, and can protect your home and pets from ticks and fleas? If so, look no further than the Dr. GreenPet Flea And Tick Spray. With its unique formula that is only comprised of 100 percent all-natural ingredients, you can always rest assured that you aren’t harming your family or pets when spraying this product in the yard or the home. If you are familiar with most flea and tick products you probably already know that most of them don’t come along with great fragrances. Fortunately, that is not the case when you invest in the Dr. GreenPet Flea And Tick Spray. This product not only provides the utmost protection, but it smells wonderful as well. When you combine this with the easy to use bottle design, you are truly looking at one amazing product that any pet owner can benefit from. With its wonderful scent, easy to use bottle, and extremely powerful, all-natural formula, you cannot go wrong when you invest in the Dr. GreenPet Flea And Tick Spray. With spring and summer right around the corner, you have probably already hit the Internet and started looking for the latest flea and tick protection devices for your pets. 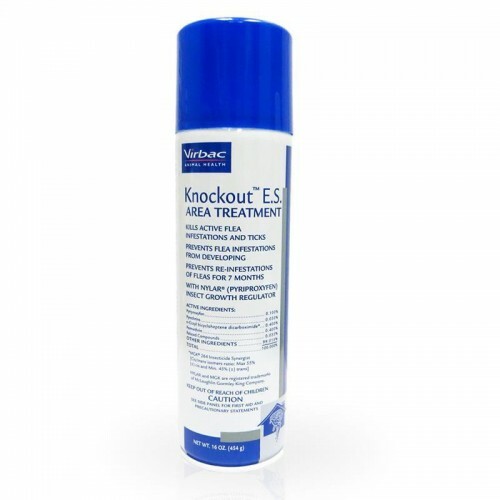 Unfortunately, you have probably discovered that there are tons of products available, but you really won’t find anything as powerful or reliable as the Virbac Knockout E.S Treatment. With its ability to provide up to seven months of protection from fleas, you can always rest assured that your house will stay pest free. If you have ever dealt with fleas in the past you already know that they can hide in the tiniest cracks and crevices, which can make them extremely hard to kill. This is why this product was specifically designed to reach fleas that hide deep in the carpet, rugs, drapes, upholstery, pet bedding, and floor cracks. In addition to this, just one sixteen-ounce can is capable of covering 2,100-square-feet. As spring and summer approaches, now is the time to get your pet’s pest protection out of the way. And, you will simply not find anything more powerful or versatile than the Virbac Knockout E.S Treatment. If you are dealing with a flea and/or tick infestation in your home, you need a quick solution. 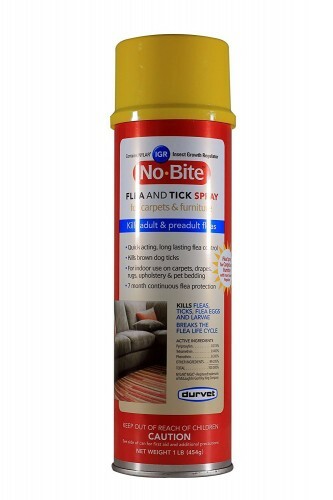 The Durvet No Bite IGR Flea And Tick Spray is designed to eradicate insects on contact. The formula is safe for use with upholstery, drapery, furniture and carpets. Just one application will go a long way in eradicating flea larvae and preventing them from developing into adults. Fleas are more intelligent than humans realize, because they will do whatever is necessary to avoid detection. In fact, these insects will burrow in carpet and upholstery fibers until they are ready to hop onto your pet’s fur. When it comes to eradicating an infestation, it is necessary to reach all of the fleas in your home. One application of the Durvet House And Carpet Spray is all it takes to eradicate fleas hidden deep into upholstery and carpet fibers. The blend of ingredients utilized in this product is also capable of killing ticks. This means that you will only need this one product to eradicate both insects. Not only will this reduce the need to invest in multiple products, but also will reduce the time you normally spend on this task. Durvet No Bite IGR Spray is ideal for all homes plagued with an infestation. One canister will go a long way in eradicating all the fleas, larvae and ticks in your home. However, you need to evacuate the home before the initial application.